Avoid the bugs, sweat, and mess, and bring gardening inside! 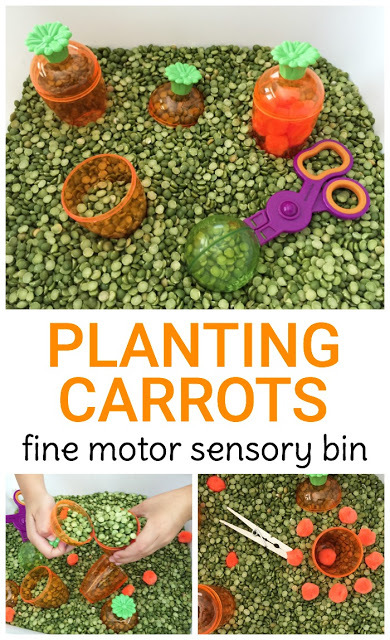 Put those gardening skills to use with our planting carrots sensory bin. Simple play ideas, especially sensory bins, are a great way to encourage independent play because there is no definite outcome expected. Your child gets to play and strengthen fine motor skills, and practice sorting and counting without needing step by step help from you! Putting our planting carrots sensory bin together is easy and includes simple materials! Each spring you can find plastic Easter eggs in carrot shapes at the dollar store and in the seasonal aisles of other stores. Stock up on the fun shapes while they are available! We poured a couple packages of dried split into the plastic bin. I made 2 of these bins for my preschoolers to play in individually. The bins are smaller than we normally play in, but worked perfectly for this activity! I added the plastic carrots, the orange pom poms, and a variety of fine motor tools to the sensory bin. 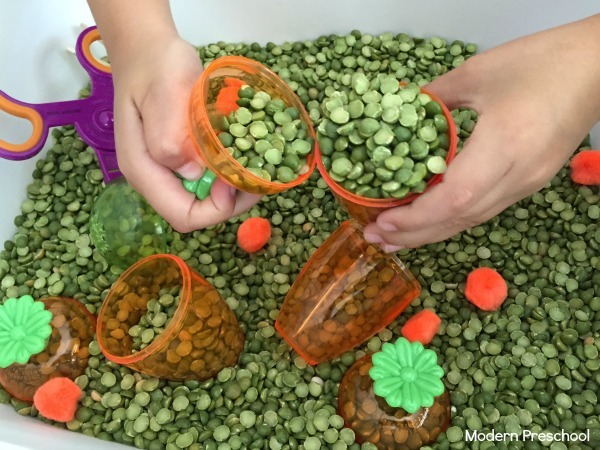 One of the best things about a simple sensory bin, is that it encourages pretend play. Burying the carrots in split peas to plant them, filling the carrots, and hiding the pom poms were all fun ways to promote conversation (and gardening silliness!). Adding fine motor tools, like the scoops and clothespins, help strengthen the muscles that will be needed to cut accurately and form letters and numbers correctly when writing in the future. Preschoolers won’t realize that they are working hard while playing in this carrot sensory bin! 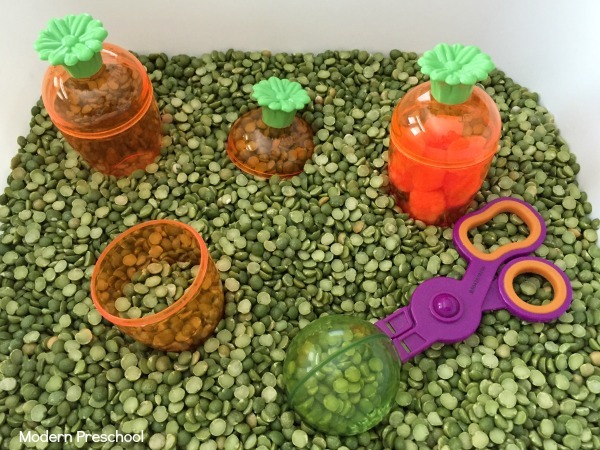 The pom poms in the planting carrots sensory bin can be used to practice counting skills too. 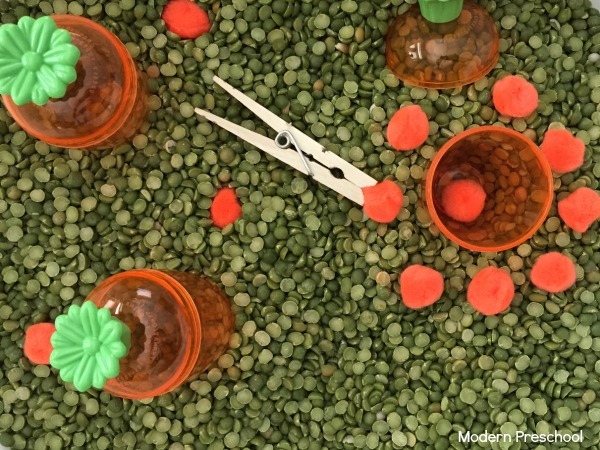 Your preschooler can count each pom pom as it’s dropped into the carrot with the clothespin. Practice counting backwards as the pom poms are taken back out!